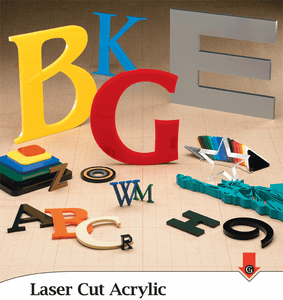 Gemini laser cut acrylic letters are lower cost than you could pay for just the materials. Available in gauges ranging from 1/8" to 1" – you won’t find this variety of acrylic anywhere else. Our state of the art computers paired with custom-designed high-speed 1000W lasers precisely cut the most customized sign work in the industry. The laser-cut polished edges are immaculate, making our acrylic product beautiful enough for any application where precision is required. 32 standard colors or choose a custom finish for your artwork converted to an exact 3-dimensional acrylic replica.